So begins Dylan Thomas’s last work Under Milk Wood. 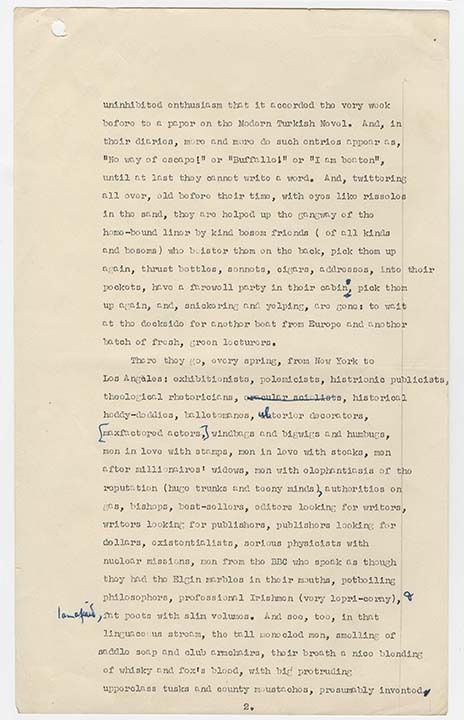 This quotation, however, is taken from an earlier work, “The Town That Was Mad.” Thomas, as anyone who looks through his papers at the Ransom Center will know, was not opposed to dipping back into the well. Under Milk Wood grew out of not only “The Town That Was Mad,” which makes up much of the first half of the radio play, but also “Quite Early One Morning,” a personal essay on life in Wales, written, like many of Thomas’s essays, for radio broadcast. 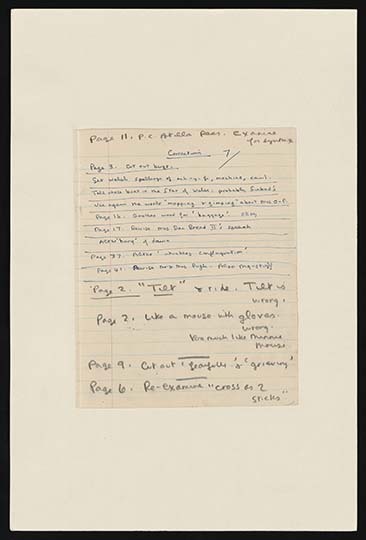 The Ransom Center’s collection of Thomas’s manuscripts, correspondence, personal records, and photographs traces both the origins of a major work like Under Milk Wood, and the evolution of a young writer making his way from precocious beginner to established intellectual. 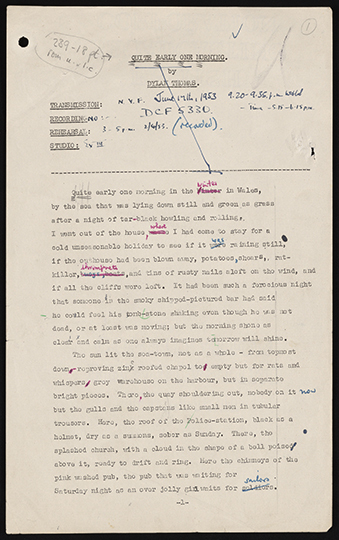 The collection features screenplays as well as essays and radio broadcasts on literary topics along with Thomas’s poems and radio plays. Thomas was a frequent doodler and visitors perusing the collection will often be greeted with humorous drawings large and small in the margin of notebooks as well as entire notebooks filled with doodles. 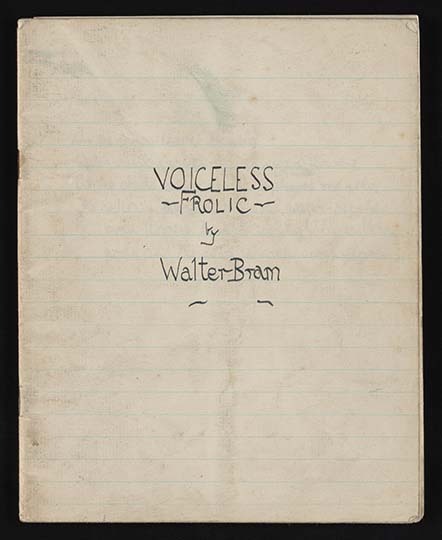 Thomas sometimes collaborated with his friends, particularly the composer Daniel Jones, with whom he shared the pen name Walter Bram. The notebooks of Thomas and Jones are also included in the collection. Anyone interested in tracing the evolution of Thomas’s oeuvre will be well-served by this forthcoming digital collection. Under Milk Wood, a 1954 radio play, has been one of Dylan Thomas’s most enduring works. It is a portrait of the fictional Welsh town Llareggub as it dreams the night away. Though it was first broadcast after Thomas’s death, it is in some ways the culmination of a lifetime’s worth of poetry and plays. 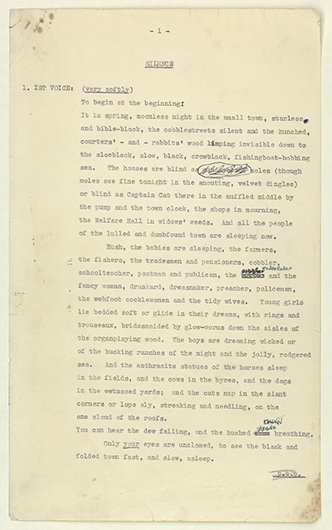 Like most writers, Thomas returned to similar themes again and again and the idea of observing a sleepy little Welsh town at night appealed to him both in his own non-fiction reminiscences, “Quite Early One Morning,” and in the fictional works “The Town That Was Mad” and Under Milk Wood. The opening pages from these three works show Thomas’s preoccupation with dreams, memories, and desires as well as his practiced ear for the rhythms of language. 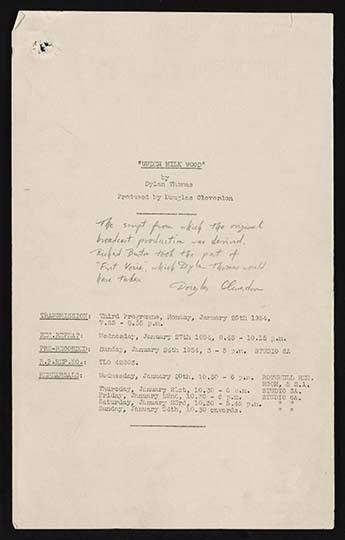 The play’s last draft was read in New York in May 1953 with Dylan handing finished pages to the actors just before the show began. The performance was recorded and is the only recording of Dylan Thomas reading his final work. 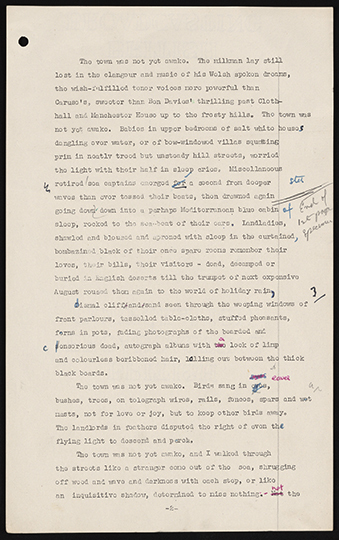 It was performed again at the Poetry Center on October 24 and 25, 1953, after Thomas made some revisions to the script and turned in copies to Douglas Cleverdon at the BBC. Thomas lost his copy of the original, which Cleverdon later found in a Soho pub. 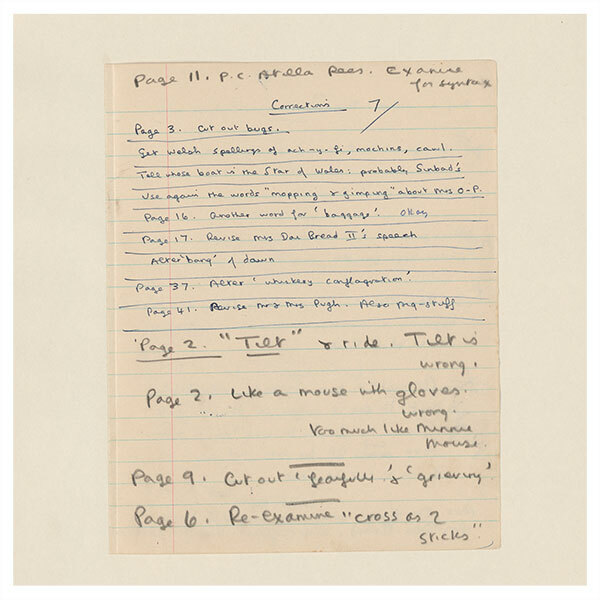 Collection material related to Under Milk Wood ranges from short handwritten notes and drafts to full-length production scripts and even translations into Swedish and French. Along with exploring Thomas’s manuscripts, researchers can look through his correspondence with friends and patrons. Many of Thomas’s letters mention his financial troubles and an overwhelming need for paying work. This may explain the varied nature of Thomas’s writing. He wrote not only poetry, but essays, broadcasts, short stories, screenplays, and radio plays as well. Correspondence with Thomas is found in other Ransom Center collections like that of Dame Edith Sitwell. It has been included with this digital collection in order to provide as complete a picture of the poet as possible. Nina Tarnawsky is a University of Texas at Austin graduate student in the School of Information, and a Senior Student Associate assisting with an ongoing project to digitize a substantial portion of the Ransom Center’s Dylan Thomas collections. 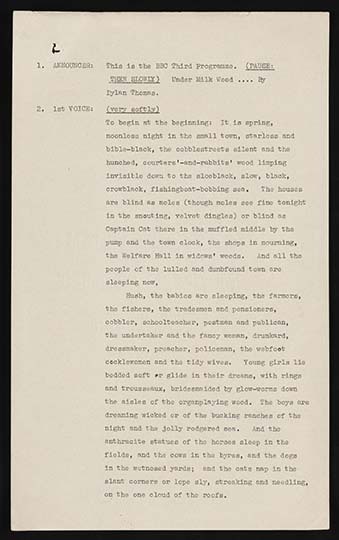 While the project is not yet online, digitized files can be accessed in the Ransom Center’s Reading and Viewing Room. 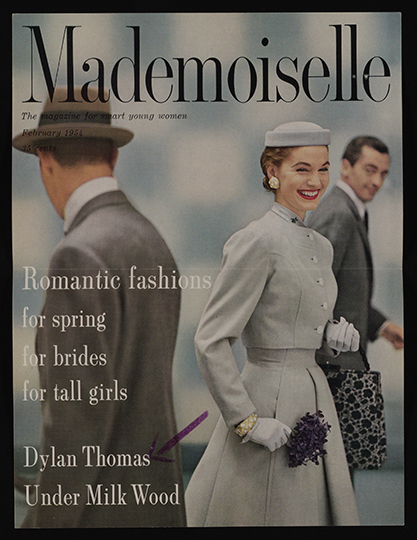 Wonderful to share this Dylan Thomas related archive with the world. He will always be my favourite poet – I have a lifetime’s love of enjoying the magic in his verse and prose.